CHICAGO (AP) — The 28-year-old Illinois man charged with kidnapping a Chinese scholar now believed to be dead was among a select few admitted to the University of Illinois' highly competitive physics graduate program in 2013. Brendt Allen Christensen originally planned to earn a doctorate degree, but told his graduate adviser in 2016 he had changed his mind, Professor Lance Cooper recalled on Saturday. He didn't say why, and Christensen continued taking classes and teaching as a graduate assistant. He earned his master's degree in mid-May. Christensen is in federal custody awaiting a court appearance Monday in the June 9 kidnapping of Yingying Zhang, the 26-year-old daughter of a working-class factory driver from China. Weeks ago, Zhang arrived at the university to conduct research in agricultural sciences and planned to begin work on her doctorate in the fall. Her body hasn't been found. 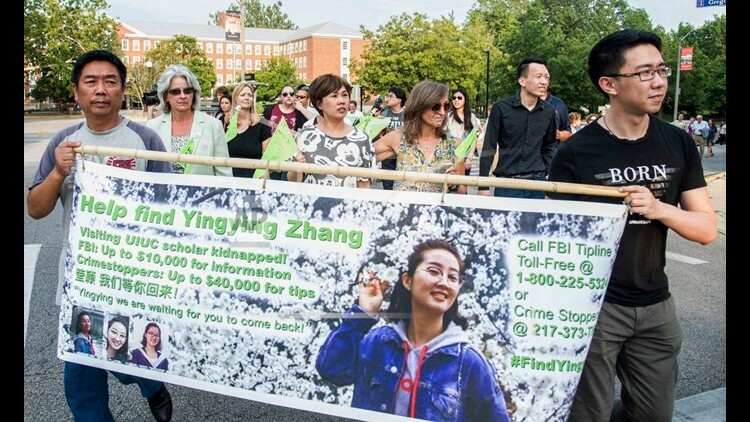 A criminal complaint accuses Christensen, of Champaign, Illinois, of abducting Zhang shortly after she stepped off a bus near the university campus. Video from nearby cameras showed Zhang, on her way to sign a lease for an apartment, trying unsuccessfully to flag down another bus. Minutes later, she's seen getting into a black Saturn Astra. The charging document says his smartphone was used to visit an online forum in April called "Abduction 101." One of the threads on the forum, which was visited months before Zhang went missing, was entitled, "Perfect abduction fantasy." Another was about "planning a kidnapping." Meanwhile, the charges came as a shock to some who knew Christensen at the university. Cooper, a director of the graduate program, said he'd received no indication of anything unusual. "There are many ways in which we find out there are problems with students," Cooper said. "We get reports they're not teaching well. We get reports from faculty that they're not doing well in classes, they're not showing up for classes. None of those flags were raised." Former classmate Souvik Dutta said he was "dumbfounded" by the news, recalling Christensen as a nice guy and "very calm." Public records show Christensen lived previously in Stevens Point, Wisconsin, and his LinkedIn profile states he graduated from the University of Wisconsin-Madison in 2013 with bachelor's degrees in physics and math. Relatives couldn't be reached for comment or declined to speak to The Associated Press on Saturday. "This is a senseless and devastating loss of a promising young woman and a member of our community," Jones said. "There is nothing we can do to ease the sadness or grief for her family and friends, but we can and we will come together to support them in any way we can." According to the criminal complaint, investigators determined 18 vehicles registered in Champaign County were similar to the one Zhang got in. One belonging to Christensen was first seen in an apartment complex parking lot June 12 — days after Zhang went missing — and investigators questioned him. The affidavit stated that investigators noted Christensen couldn't recall what he was doing the day Zhang disappeared. They searched the vehicle but didn't remove anything. Investigators later determined the car in the video had a sunroof and cracked hubcap, like Christensen's car, the affidavit states. When investigators interviewed Christensen again, he acknowledged driving around the campus and giving a ride to an Asian woman who said she was late for an appointment. Christensen said the woman panicked after he apparently made a wrong turn and he let her out in a residential area. Zhang graduated last year with a master's degree in environmental engineering from one of China's elite schools, Peking University Shenzhen Graduate School. Friends and family said she dreamed of one day landing a professorship and helping her parents financially.